Dr. Stuart Sprague (SS) from the North Shore University Health System and University of Chicago Pritzker School of Medicine discusses his abstract for the National Kidney Foundation’s 2014 Spring Clinical Meetings (SCM14), Concomitant Intravenous Iron Use Drives Changes in Iron Indices in a Phase 3 Study of PA21, with Dr. Kenar Jhaveri (eAJKD), eAJKD Editor. eAJKD: Why don’t you tell us a little about your research and abstract being presented at NKF 2014 Spring Meetings? SS: This large randomized clinical trial, which included more than 1050 patients, was conducted to investigate efficacy and safety of a new phosphate binder Velphoro (sucroferric oxyhydroxide) in comparison to sevelamer carbonate over 52 weeks of treatment. Velphoro is a non-Ca, iron-based phosphate binder. In in vitro studies, it demonstrated a high phosphate binding capacity over the whole physiologically relevant pH range and showed promising results in clinical phase I and II trials. In this recent phase III study conducted in hemo- and peritoneal- dialysis patients, we demonstrated comparable efficacy of Velphoro and sevelamer carbonate, but with a substantially lower pill burden in Velphoro treated patients. On average 3.3 pills per day of Velphoro were required to manage serum phosphorus levels compared to 8.7 pills of sevelamer carbonate. Both phosphate binders were well tolerated and the safety profiles of Velphoro and sevelamer carbonate remained comparable over 52 weeks of treatment. 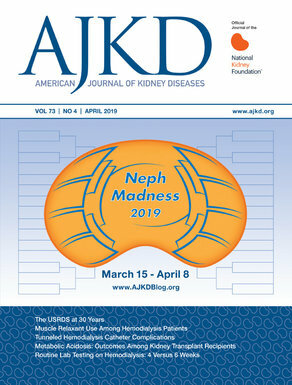 For this abstract that we will be presenting at the NKF 2014 Spring Meetings a post-hoc analysis of the phase III study was performed to investigate the impact of concomitant intravenous iron use and Velphoro on iron indices over 52 weeks of treatment. Taking into consideration that Velphoro is an iron based phosphate binder, we wanted to investigate whether Velphoro might impact iron indices over one year of treatment and how much of the observed changes in iron indices can be attributed to intravenous iron use. The phase I study demonstrated that iron absorption from Velphoro was minimal and we did not observe any specific trends in iron parameter changes in a previous phase II study. However, we observed an increase in ferritin and transferrin saturation (TSAT) in this phase III study, simultaneously noticing a relatively high baseline values of iron indices in both treatment groups, especially in the US patient population, indicating a high use of intravenous iron prior to study entry as well as during the study (close to 74% in Velphoro group and 80% in sevelamer group were treated with iv iron concomitantly). Thus, the current analysis compared the changes in iron indices in those patients who were treated concomitantly with iv iron during the study to those patients that did not receive iv iron. The results are presented in the abstract, which demonstrated that in both treatment groups the largest increase in serum ferritin was observed in patients that were treated with iv iron, however there was a difference between the mean increase in ferritin in Velphoro and sevelamer treated patients. Interestingly, a moderate increase of ferritin was also observed in patients who were treated with Velphoro and did not receive iv iron in contrast to the same subpopulation of patients in sevelamer group. TSAT increase was seen only in patients treated with Velphoro, including those without iv iron. Increases in iron indices plateaued over the first 24 weeks of treatment and remained stable during the duration of the study. No clinically meaningful changes in hemoglobin were observed and we did not observe any signs of iron accumulation in patients treated with Velphoro. We concluded that concomitant iv iron drives changes in iron indices in dialysis patients, however, minimal iron absorption from Velphoro might contribute to the observed changes in iron parameters and could explain the differences between the two treatment groups. eAJKD: What were the infection rates in both groups? SS: The infection rates were comparable in both treatment groups and were comparable to the reported prevalence rate for infections in this multi-morbid population of dialysis patients. eAJKD: Where do you and your group go from here? SS: Velphoro was recently approved and launched in the US and is under regulatory review process in Europe and other regions/countries. We believe it is an advantage to have a new alternative phosphate binder in patients where treatment adherence is low and the serum phosphorus control remains a challenge. This study clearly demonstrated that we can lower the pill burden with Velphoro and may improve patient adherence. We now want to evaluate how Velphoro works in a “real life” setting and how well patients accept this new treatment by establishing observational studies. In addition, we hope to include this phosphate binder into the model we are developing to optimize serum phosphorus control based on specific binding capacity of certain phosphate binders, patients` diet and dialysis prescription. We still have a lot of open questions in CKD-MBD management in patients with earlier stages of chronic renal disease. Use of the new drug in this patient population would also be of high interest. Click here for a full list of SCM14 abstracts of poster presentations. Hi I read the article in the newsletter of National Kidney Foundation in November. I actually despised taking the Renvela it was 4 tablets 4 times a day and it got to a point where I just didn’t want to eat anymore and it was giving body aches. See when I actually took the pill I noticed aching all over and when I didn’t take it I was fine. So I told my Nephrologist about the Velphoro and little by little it was going down so far I am always remembering to take it before I start eating and always have it in my purse. Thank you for helping me being able to take care of myself and feel better.